LOOK! Stunning Picture Of Calbuco Volcano Erupting In Chile : The Two-Way The volcano erupted, spewing a huge cloud of ash over a sparsely populated area in Chile. Authorities, however, issued evacuation orders to about 1,500 people. The Cabulco volcano in southern Chile erupted on Wednesday spewing a huge cloud of ash into the sky. Authorities issued evacuation orders for about 1,500 people. But, the AP reports, luckily the area is otherwise sparsely populated. 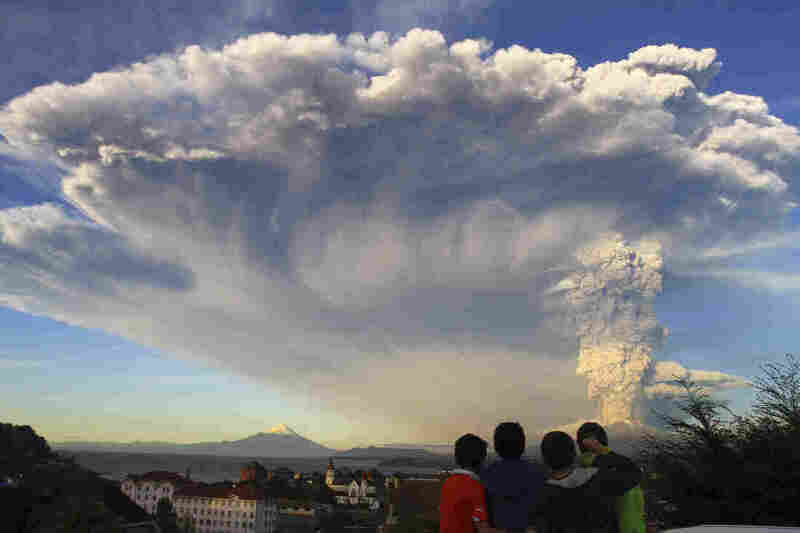 Children watch the Calbuco volcano erupt, from Puerto Varas, Chile, on Wednesday. Authorities ordered the evacuation of the inhabitants of the nearby town of Ensenada, along with residents of two smaller communities.